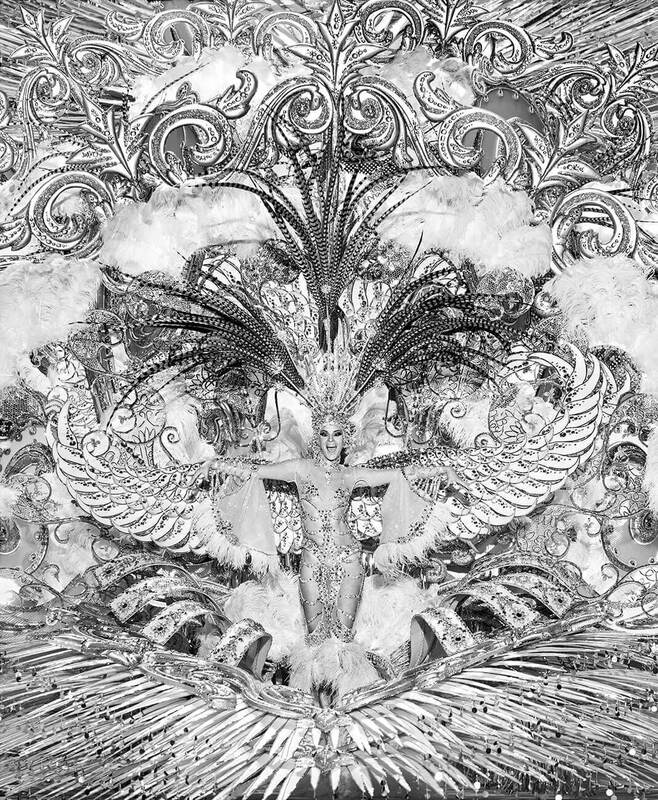 To fully appreciate the graphically dazzling subjects of Cyril Porchet’s Reina, it is necessary to understand the series’ place at the end of a long conceptual trajectory, shifting between figuration and abstraction in the effort to convey human systems of power and control through the two-dimensional image. Often by pushing the visual saturation point to its intoxicating limits, Porchet is able to show mankind’s efforts to exert command over the religious, political, and cultural realms through different visible and invisible manifestations of the architectures of power. Neither overtly criticizing nor celebrating these scenes, he shows us through the malleable eye of the camera the means by which form, space and movement can subtly, silently impact our subconscious state. His subsequent Meeting series, which looks at meetings of the general assembly of European businesses and shareholders, came out of this previous set to provide a contemporary answer to the common question of religion’s place in his work. Using “a more Protestant way to communicate,” Meeting is intended to reflect where ‘the power’ lies today: in contemporary society’s new religion, big business. 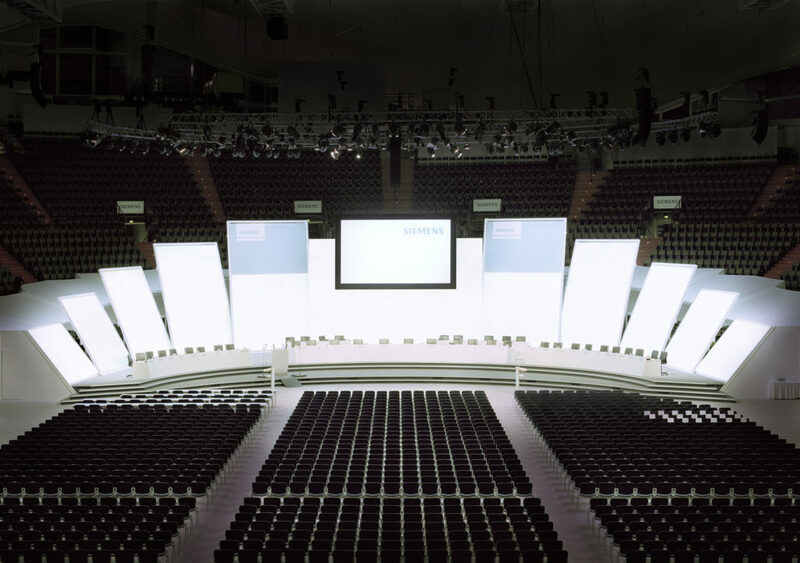 The brazen transparency of these meetings struck Porchet, with the readily visible power dynamic at play in their physical organization, the “chairs organized like Roman armies” in commanding, theatrical event spaces and stadiums. Natural instances of chaos and structure interweaving as inspiration for Porchet’s work. 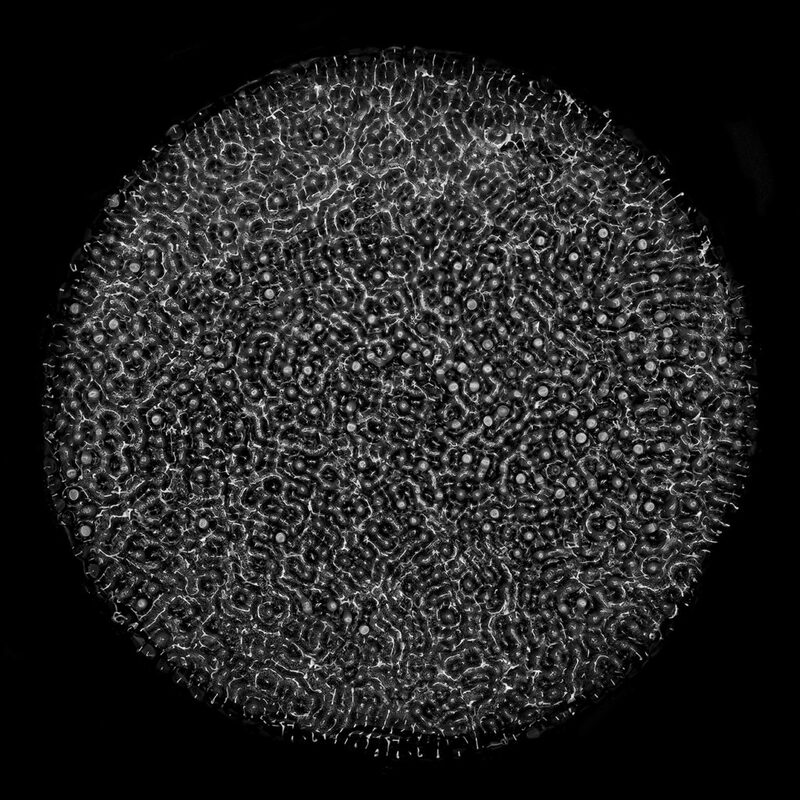 An interest in this relation between structure and chaos pushed him to his next visual endeavor, his Crowd series, which brought back a human presence that in his previous series was only implicit. 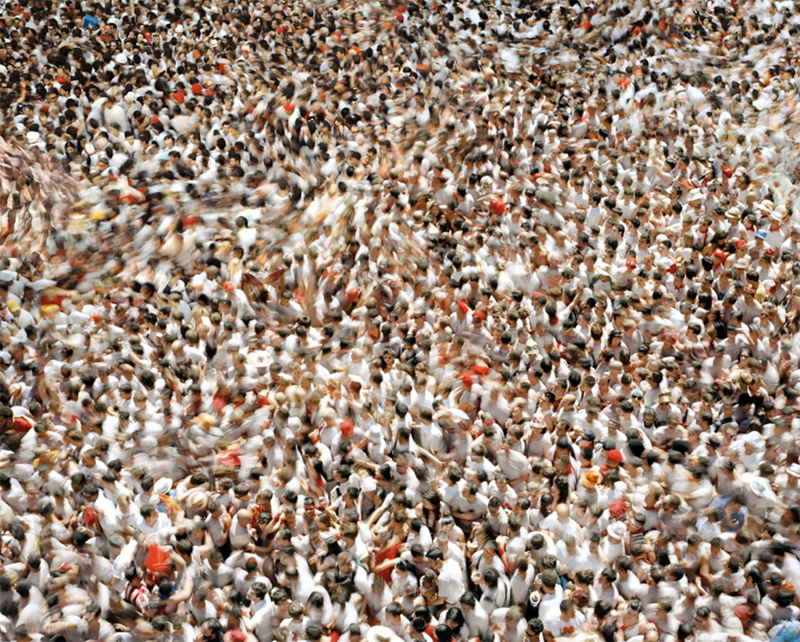 All the Crowd images are captured at folkloric, traditional events: “I thought it was interesting in a period where everything is going in the direction of globalization to go to these traditional mass events—and I thought it was interesting because there was some color dominance that brings us back to the idea of a clan, a group, a flag.” These color trends as well as “the fluid mechanics, the dynamics of these crowds” are made visible using a long-exposure technique that brings otherwise invisible patterns to the surface of his images. 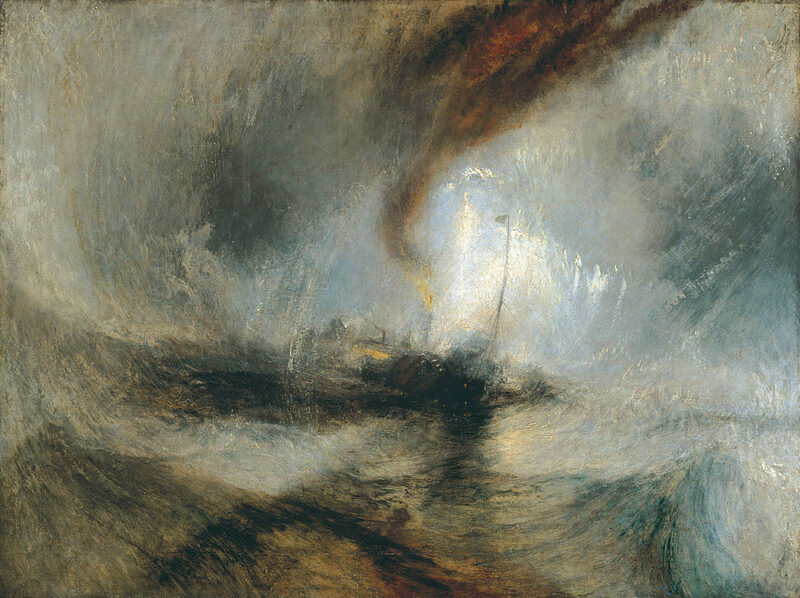 J. M. W. Turner, Snow Storm: Steam-Boat off a Harbour's Mouth, c. 1842. Public domain. 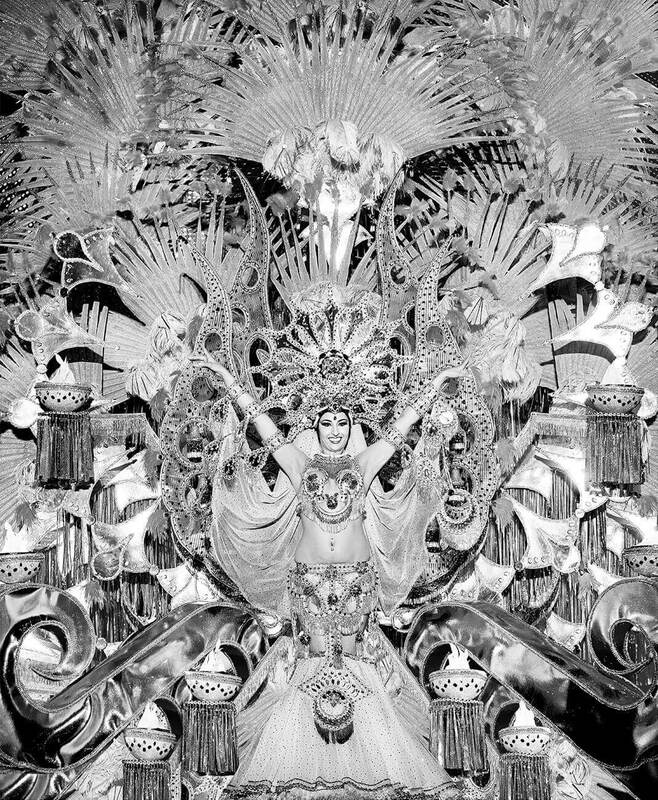 Finally, from the deindividuated crowds, Reina came about as a return to the individual subject—though some of the Crowd images were in fact shot simultaneously, during the Carnival of Santa Cruz de Tenerife, the site of Reina. 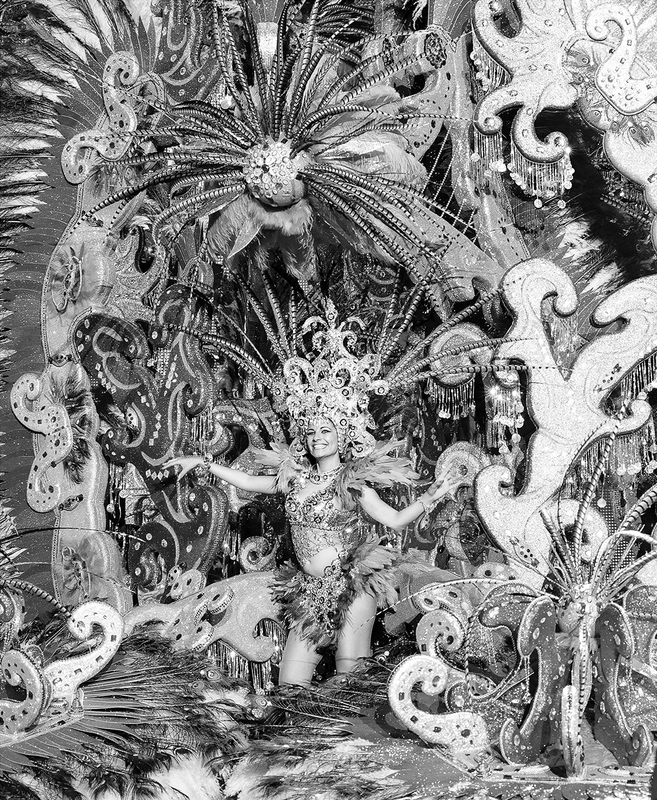 Carnival represents a celebration of “the structure taking over the chaos, the arrival of spring, life over death . . . and these [women in the images] are the queens of it.” The gala to elect the Carnival Queen (or Reina, the Spanish word for queen) is the most important event of the entire carnival, as each contestant in turn displays herself onstage in all her finery for the jury and gathered crowds to judge. Queens also of endurance, the contestants carry more than the mere burden of competitive pressure, for the uniquely elaborate decoration behind them is not a backdrop as one might presume; rather, everything we see is a costume, affixed to each woman’s body—making each a kind of one-woman tableau vivant. 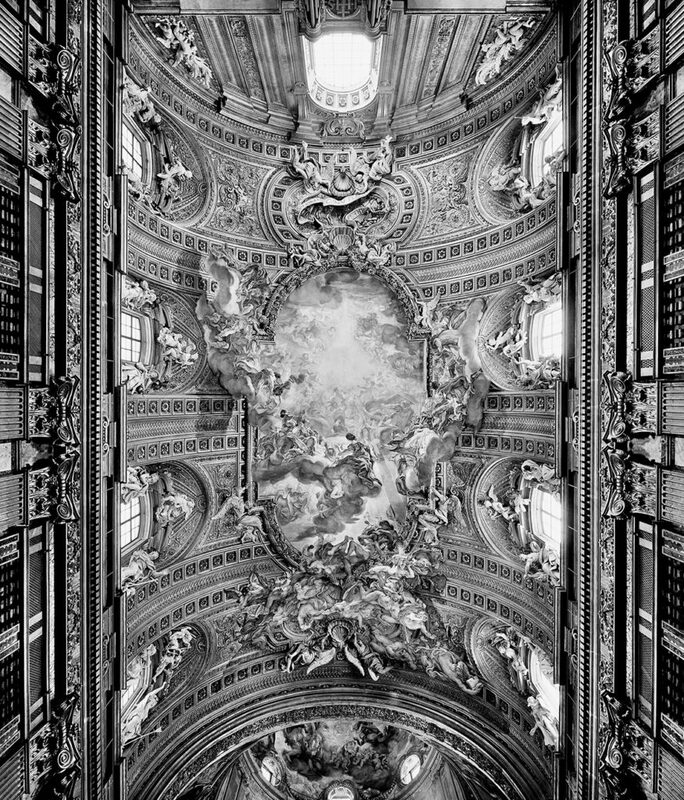 To render these women adorned in ornamentation as lavish and opulent as the baroque churches, Porchet drew upon the same photographic techniques he had used for his earlier series: flattening the many different layers and dimensions of each image, and opting in this case—as in a complimentary series, Vertigo, of the church ceilings—to make them black and white so that the women would disappear into the surrounding details and a uniform typology would become possible. 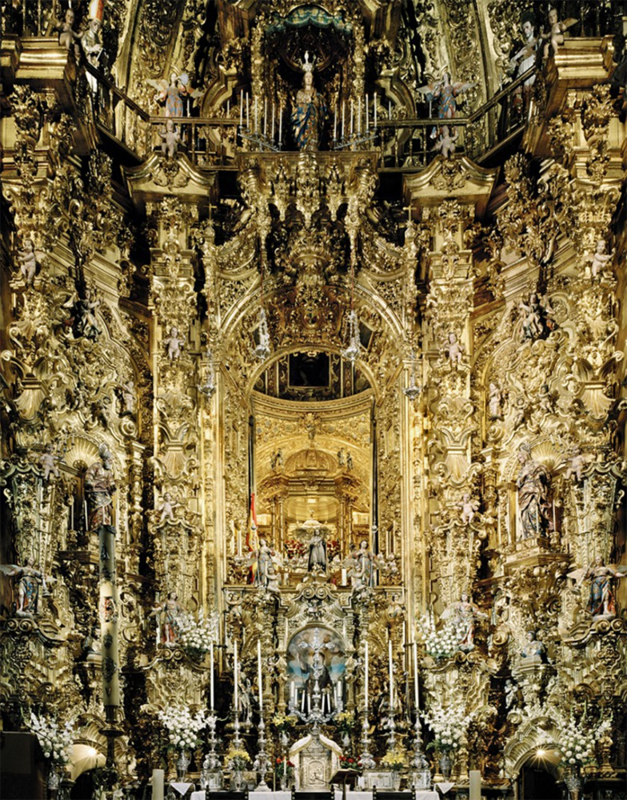 In the baroque churches, he points out, the ceilings are an awe-inspiring fusion of trompe l’oeil painting and architecture, constructed such that one medium is indistinguishable from the other, and the flattening effect acknowledges the deliberate synthesis of these two forms. 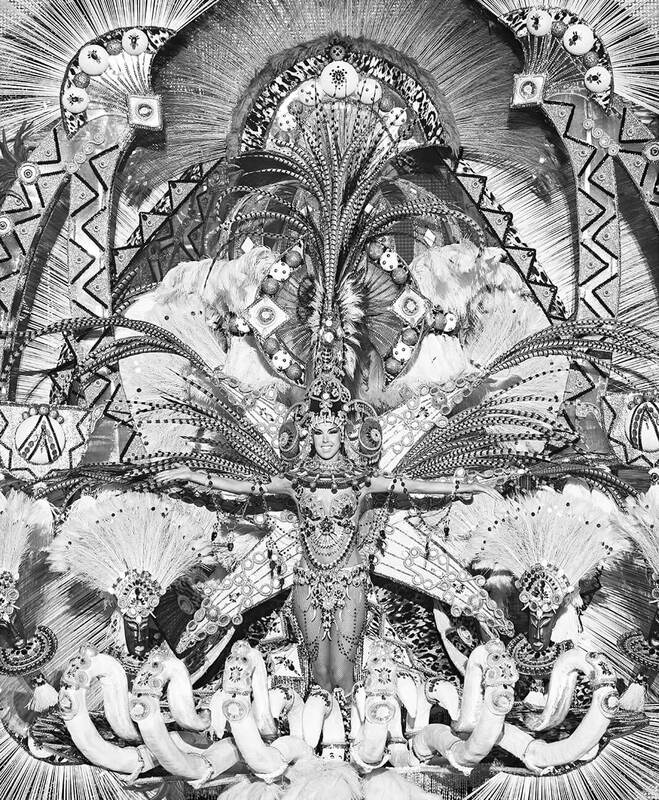 The queens of Carnival are given an equally illusory quality in Porchet’s images, wherein it is impossible to locate where the person ends and the costume begins. 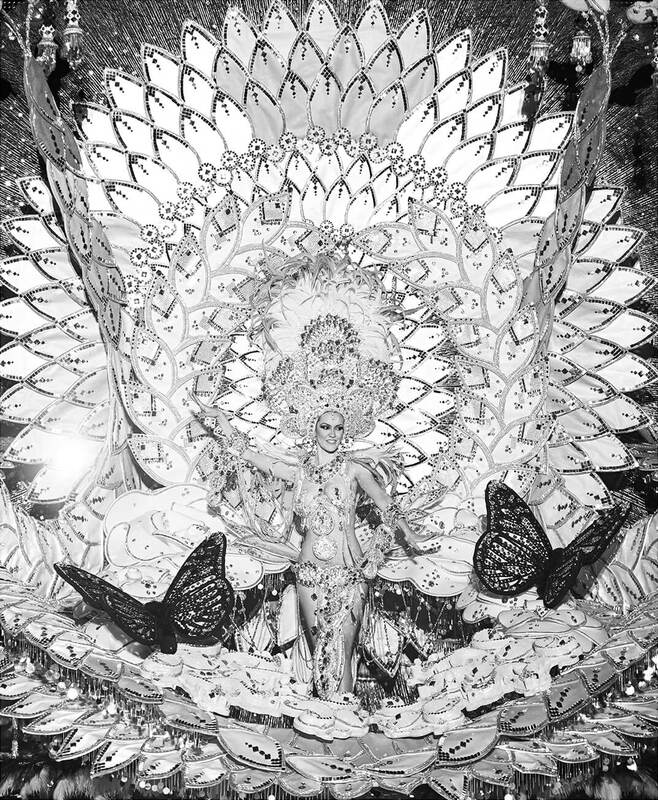 Visually blending costumes and bodies into one are elements of painting and architecture superimposed on the human form to the point that the woman is merely a vessel for the encompassing structure with which she has temporarily fused. 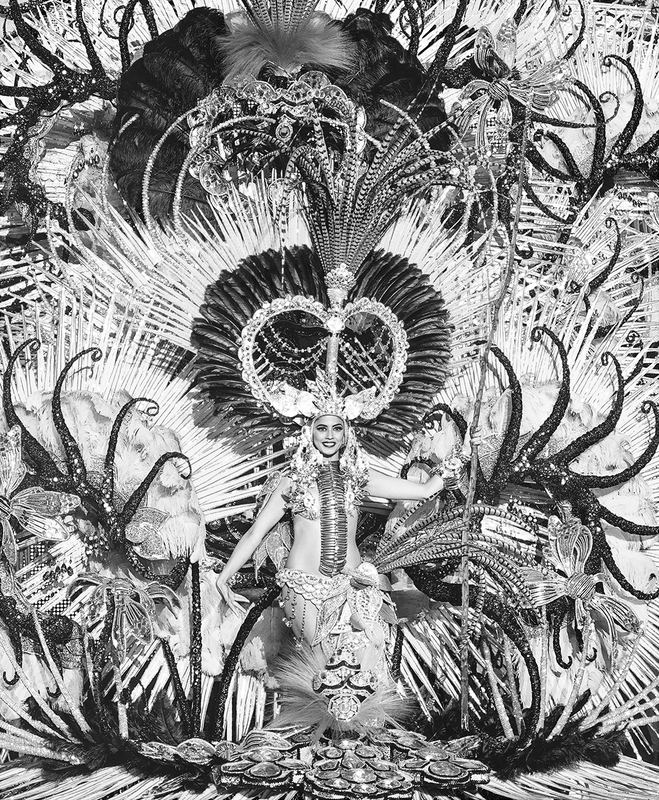 Until they arrive on stage, the competing queens are in a state of apprehensive agony, grimacing as their gargantuan headdresses teeter dangerously from their skulls and their final accoutrement are put in place—which Porchet discovered his first time at Carnival, thinking he could portray the women in their element backstage. Reina captures their ultimate moment of performative presentation, as they lift up their heads and put on their masks of gracious delight for their audience, a form of perfected propaganda; but it is only through the static image that this unsustainable state becomes a piece of permanent theater, where both structure and chaos are able to coexist within a single frame. nineteensixtyeight presents a selection of 9 images from the series Reina, available to buy in our shop.